The Griswold Controls Automatic Flow Limiting Valve is used in many different applications, mostly in the HVAC industry to maintain balance in a HVAC System. The stainless steel flow limiting cartridge has a spring loaded cup that dynamically absorbs pressure fluctuations resulting from changing system conditions due to varying heating/cooling loads. These fluctuations in pressure, within a given pressure differential control range, do not change the flow through the valve, therefore the flow is controlled to within +/- 5% of the designed flow. For a demonstration of the flow control valve in action- click here. Automatic Flow Limiting Valves do not require any additional balancing as do Manual Balancing Valves, therefore they reduce labor costs from not having to balance and rebalance the valves. Isolator R, Isolator Y and K valves are available with a wide range of flows and PSID ranges, and are the perfect choice for tight spaces. 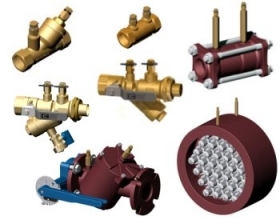 The valves offer easily accessible flow control cartridges, accessible without breaking piping connections, so exchange of the cartridge for flow changes can be made as required. Isolator and K valves are the perfect choice for terminal boxes, VAV boxes, fan coil units, heat pump installations, and base board/in cabinets. F-4376 (PDF) How Do I Choose a Cartridge?